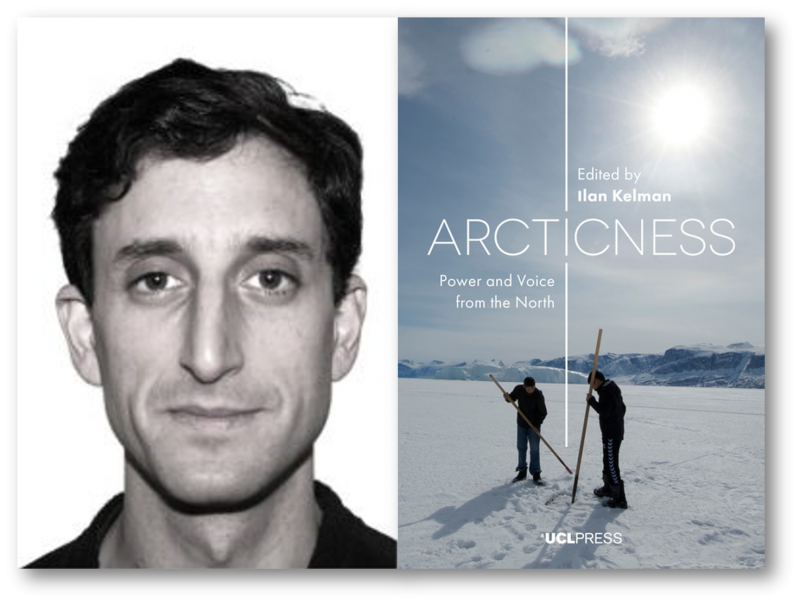 Lana Ollier, Associate at Polar Research and Policy Initiative, speaks to Dr Ilan Kelman on his recently published book Arcticness: Power and Voice from the North, his research interests and Arctic Voices. Dr Kelman is Reader in Risk, Resilience and Global Health at UCL Institute for Risk and Disaster Reduction and UCL Institute for Global Health. He is also Thematic Director for Global Environmental Sustainability at the UCL Global Governance Institute; Professor II at the University of Agder, Norway; Co-Director of Many Strong Voices (MSV); and is on the Advisory Board of Polar Research and Policy Initiative. His research focus is on risk, resilience and global health, with a geographical focus on small island developing states and the Arctic. Dr Kelman’s new book Arcticness: Power and Voice from the North was launched in August 2017. How did you first become interested in the Arctic? Whether we are affluent or poor in London or affluent or poor in Delhi, we all face development challenges, sustainability challenges, life challenges and livelihood challenges. My interest is simply helping people who ask for help. If we talk about London or Delhi, there are many mechanisms in place to deal with those challenges, and there are also many people researching them. Hence, I believe there is not a lot that I can contribute. Countries like India and Nigeria have world-class scholars, institutions, and a lot of resources, but island states like Tuvalu or islands like Baffin Island have tiny populations and lack those resources. So that is where I feel like I can make the biggest difference, if these people invite me. This is why I focus on islands. The Arctic is very much part of this, because so many Arctic communities are islands and even those that are not have many similar characteristics. Those characteristics stereotypically are isolation, marginalisation, smallness and their location on the coast. There is a lot of truth in those stereotypes, and there are countless exceptions and counterexamples. Part of my research and work with the communities is to determine whether or not those stereotypes are appropriate and if so why or why not. We then focus on working within those similarities and differences. The aim of the Many Strong Voices program, which I co-direct, is to create a platform for Arctic peoples and peoples from small island developing states to learn, exchange and teach by comparing their similarities and differences. Who is Arcticness aimed at? Anyone with an interest in the Arctic. That includes academics and non-academics, peoples from and living in the Arctic, but also those who have never been there. It is supposed to be an introduction for everyone who has an interest in the northern latitudes and provides new angles and viewpoints for those who have many experiences in the Arctic. Could you explain the concept of Arcticness? We chose to develop the concept of Arcticness because we felt like it embodied many of the discussions, which are often not fully articulated. It is easy in academia to write 10,000 words of long sentences with difficult words, but the question remains: What does it mean to the peoples and for the peoples? We felt that it is important to recognise and give a voice to those many strongly diverging viewpoints of what the Arctic is and what peoples feel it should be. Different peoples have different perspectives and we felt that by taking an idea like Arcticness and explicitly not rejecting any perspectives, we would be able to move some of the discussions forward. Therefore, the book does not explicitly say we should adopt the concept or reject it, but instead we should explore and examine it and see of what use it is and is not. Arcticness becomes an idea to explore and see what will come from it, which may also be to not move forward with this concept. What is the conclusion you reached in exploring the concept of Arcticness in your book? The conclusion from Arcticness is that there is strength in diversity. The Arctic, Arctic peoples, Arctic ideas and Arctic ideals mean so many different things to different peoples. Our conclusion from Arcticness is that this is not necessarily negative. Instead, we can still come together and we can still think about the future or futures of the peoples and communities in this region on their terms, recognising and being sad about some changes, while still being inspired and happy about what we can do about the changes. At the same time, we can also say that the Arctic voices require far more prominence, and we need to be thinking about the Arctic far more from the perspective of the peoples in the Arctic, not just from a perspective of southern-, resource-, extractive-, environmentalist, and scientific interests in the region. How can Arctic voices become powerful and why is power important? We find that Arctic peoples, because of the stereotypical characteristics that I mentioned earlier, feel like they are not being heard, are often not deciding for themselves and few listen to them or their interests. They are often very actively disempowered and deliberately bypassed. To a large extent, the country capitals are taking power away from them in making decisions and moving forward without considering what the communities and the peoples want. By highlighting some of those issues and by providing options and opportunities for those voices to be heard, we let them develop, create and build power. Power is important in this context, because we can hear their voices but power means that we must listen as well. What can we do in order to promote Arctic voices? Don’t make assumptions! Talk to the peoples and see the communities with the aim of understanding their different perspectives even if you disagree with them. Do not just hear but listen. And whether you are an environmentalist with Greenpeace, suggesting stopping resource extraction in the Arctic, or whether you are a person with an oil company, saying that resource extraction combined with corporate social responsibility measures will create economic benefits for the communities: Stop, take a deep breath and start talking to the peoples from and in the Arctic. This remains a challenge. Often, the CEOs of oil and gas companies don’t seem to have a lot of interest in listening to or acknowledging those voices. And while governments in Oslo and Moscow do generally show an interest in engaging, they only hear some of the voices and fail to recognise the diversity of interests. Instead, they tend to just hear the voices that match their preconceived ideas. How did you select the different contributions to this book to ensure that it has accounted for the diversity of voices? We tried to develop this book around the idea of collective knowledges. The UCL Global Governance Institute very kindly funded some workshops related to governance issues. I set up a workshop on polar change and put out an open call for everyone to turn up and contribute. In the workshop, we realized that we had to go beyond change and beyond governance and therefore we jointly came up with the concept of Arcticness. So we did not set out to explore this concept, but the concept emerged from the workshop. The contributions were selected by the people who turned up to the workshop and provided information. The contributions were open to everyone and entirely voluntary. This is an example of collective knowledge and the power of bringing voices together. How does this “Arcticness” fill a gap? What we hope to do is to add to the voices and to add to the discussions and bring different viewpoints to what people are considering. Therefore, we very deliberately set out for diversity and diversity of the peoples, disciplines and approaches, recognising that no community is homogenous, there is no single solution for a community and there is no one-size-fits-all approach across all communities. So we hope that we have something unique by combining academic chapters with personal reflections and poetry. We hope that we have something unique by having both peoples from the Arctic and from outside of the Arctic. We hope that we have something unique in recognising the multiple peoples and disciplines; recognising law is as important as anthropology and as important as art. Coming up with this framework of Arcticness, we hope that we can make more voices heard and get a discussion going, accepting that there is strength in diversity, even if we radically disagree with each other. What did you learn in editing this book and what surprised you the most? The main learning experience was just to gain more knowledge of peoples, places and ideas from the Arctic. Are we really ever expert in any place or any people, even our own? There always remains a lot to learn and to think about. For me, it was such a huge gain in my own understanding of the Arctic. What was most surprising is that people are able to connect around a concept and push forward an agenda on behalf of the peoples. This was very encouraging and inspiring, showing that, despite the difficulties of the changes we are experiencing and despite the difficulties with many of the elected leaders, we can still come together as academics and practitioners to push forward Arctic-based agendas. Dr Kelman’s new book Arcticness: Power and Voice from the North (August 2017) published by UCL Press is available to download or order here. Lana Ollier is an Associate in the Geopolitics and Security Unit at Polar Research and Policy Initiative and leads our interview series ‘Polar Matters’. She is currently completing a MSc in Environmental Policy and Regulation at the London School of Economics. She holds a Bachelor’s degree in Political Science from the Freie Universität of Berlin.